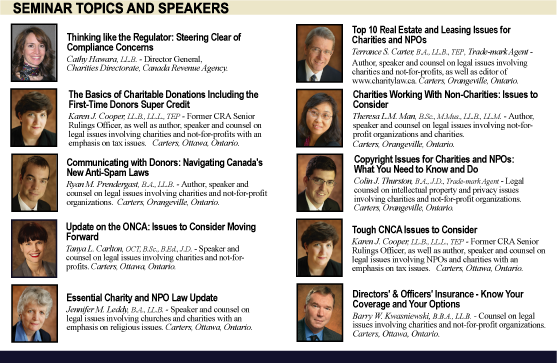 The Ottawa Region Charity & Not-for-Profit Law Seminar, hosted by Carters Professional Corporation in Nepean, Ontario, on February 13, 2014, was attended by more than 300 professionals from the sector, including directors of charities, government officials, accountants and lawyers. Designed to assist charities and not-for-profit organizations in understanding and complying with recent developments in the law, the related Church & Charity Law seminar has been held annually in Toronto since 1994, with the Ottawa seminar first added in 2008. The lawyers from Carters Professional Corporation, a law firm with offices in the Toronto and Ottawa areas, are experienced in advising churches, charities, and not-for-profit organizations across Canada, as well as internationally. The seminar also included a presentation by guest speaker Cathy Hawara, Director General of the Charities Directorate of CRA. All handouts and presentation materials are available at the links below, including a summary of federal budget 2014, in the order as presented, with the Learn More links being Power Point slide shows. We try to make materials available in both printer friendly [PDF] and web browser friendly [HTML] formats. To view and print PDFs, you must have Acrobat Reader installed on your computer, Click on the icon to install it now.